An amber warning is in force for Thursday. Storm Doris is set to batter the East Midlands on Thursday, with an amber weather warning in force as 80mph winds looks set to cause damage and bring possible risk of injury. 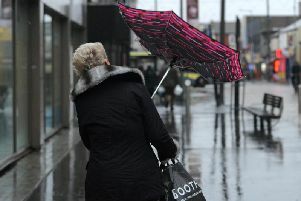 The Met Office is forecasting gusts of 70 to 80mph for Thursday with damage to structures, interruptions to power supplies and widespread disruption to travel networks likely, along with a danger of injury from flying debris. It adds: "Heavy rain is also likely through Thursday as well as some snow over high ground as the system clears eastwards. These may prove additional hazards. "A developing area of low pressure is expected to move across the UK on Thursday. The exact timing and track of this system remain uncertain but there is potential for a short-lived core of very strong winds to develop. Whilst some disruption is expected outside of this stronger swathe of winds, the amber area looks most likely to see more significant disruption." The amber warning is in place for Derbyshire and Nottinghamshire from 6am to 8pm on Thursday. We'll be bringing you all the latest on any disruption to travel or damage caused by Storm Doris when she hits on Thursday. Keep checking our website for updates. And don't forget to share your pictures with us. Email them to our newsdesk or share them with us on Facebook or Twitter.